I went yesterday to see this Dora Billington jug in the Manchester Art Gallery. I saw it there about twenty years ago but it has not been on display for several years and I had to go down into the store to look at it. It made an impression on me when I first saw it and it was the starting point of my interest in Billington because it showed her mastery of maiolica, a technique not widely practiced by British potters and not held in high esteem by collectors of British studio pottery. From this interest came a determination to bring her work to to wider notice and this jug will be shown in an exhibition of her work that I am organising at the Crafts Study Centre, Farnham, next year. The jug, about 30cm high, was made in 1942. Billington said that she turned to art to escape the anxieties of war. Much of the Central School of Arts and Crafts, where she had taught for over twenty years, had been evacuated and the building in Southampton Row was damaged by bombardment. In those conditions she made this beautiful and life-affirming piece of pottery – one of her best. The calligraphic brush work is absolutely characteristic. She had trained in calligraphy with Edward Johnston at the Royal College of Art and had worked part-time as a decorator for Bernard Moore when she was a student, so this sort of loose, free decoration became second nature to he. It was a great pleasure to see it again. In his current Channel 4 series, “Old House, New Home”, architect George Clarke asks potter Chris Bramble to make an umbrella stand for a couple featured in the programme and George has a go at throwing himself (above). (Series 3, Episode 1) George makes a pretty good fist of it, handling a large lump of clay, and, on his first go he does better than many beginners manage after a year of evening classes. I guess there are certain abilities, like the spatial awareness of the architect or the turning ability of the engineer, that can be transferred quickly to throwing on the wheel. Physical strength is essential, so is hand-eye co-ordination. Other qualities that make a good thrower are observation, discrimination and taking care. I have seen experienced amateurs who simply do not notice essential details of their making, such as the profile of a rim or a foot-ring. As in many occupations, like sport and music, good pottery-making depends on some innate qualities that cannot be learned. The Oxford Dictionary of National Biography (DNB) is filling the gaps in its coverage of notable women and pottery is benefitting from the addition. I have been asked to write entries for Mary Wondrausch and Dora Billington. Mary Wondrausch, who died in 2016, is well known to studio potters, especially those who are interested in slipware. She was important in its revival and wrote about it in a scholarly way (Mary Wondrausch on Slipware, A & C Black, 2001). Dora Billington (1890-1968), the most significant studio pottery educator in the 20th century, is less well known, even though some of her most eminent students (Alan Caiger-Smith, Gordon Baldwin and Anne Wynn-Reeves) are still alive. She began teaching pottery in the style of Alfred and Louise Powell but in the 1920s she responded immediately to the new pottery of Staite Murray and Bernard Leach. Her most important contribution came after the Second World War when studio pottery seemed to be full of second-rate Leach imitators. Taking her inspiration from the European tradition, she-encouraged new ways of making, notably the tin-glazed pottery of Caiger Smith, Wynn-Reeves and William Newland, and the sculptural ceramics of Baldwin and Gillian Lowndes. Her Technique of Pottery (1962) is still worth reading. Perhaps there are other entries that could be written on women potters. The DNB has articles on Katherine Pleydell-Bouverie, Lucie Rie and Gillian Lowndes, but nothing at the moment on Louise Powell, Nell Vyse, Dora Lunn, Stella Crofts, Nora Braden, Ursula Mommens or Helen Pincombe. Tidying up my papers, I came across this old postcard, which I’d picked up at Gary Grant’s shop in Arlington Street behind Sadler’s Wells. The shop has been closed for many years, but I liked to pop in when I was going to the theatre to look at his excellent collection of mid-century pottery, especially his collection of Rye Pottery. These are Rye butter dishes. The Rye Pottery was set up by Wally and Jack Cole and thrived after the war, capturing in their bright, whimsical ceramics the spirit of he Festival of Britain. They made tin-glazed tableware and decorative figures, which were very much of the time. The same spirit was expressed in the contemporary pottery of the Bayswater Three, William Newland, Margaret Hine and Nicholas Vergette, who made a good living decorating the interiors of coffee bars. This sort of pottery ran against the Leach current of Chinese-inspired stoneware. Newland found Leach’s dominance irritating but the Coles just got on with it. Their pottery still exists in Rye, still making tin-glazed wares. Walter studied at the Central School of Arts and Crafts in the 1930s, when Dora Billington was teaching there and at a time when she was making exquisite tin-glazed ceramics, and he was subsequently a member of the Arts and Crafts Exhibition Society, of which she was a leading member. Rye was a rare example of a commercially successful craft pottery. Kenneth Clark and Ann Wynn-Reeves ran a similarly successful enterprise, concentrating on tiles but also making use of decorated tin-glaze; and they were also graduates of the Central pottery course. Gordon Forsyth, who I wrote about yesterday, was well-known to Dora Billington, who taught at the Central School of Arts and Crafts for thirty-five years and who is also famous for her sympathies with factory pottery; but she had an ambivalent attitude towards her home town of Stoke-on-Trent and I don’t believe she ever worked there after leaving Hanley art school in 1912. Nevertheless, after the second world war she made a term in The Potteries a compulsory part of the course at the Central. The history of studio potters offering their talents to industry is not happy. Michael Cardew, who we think of as one of the most anti-industry potters, was inspired by a temporary interest in Marxism to work in one of the Stoke-on-Trent potteries, but they considered his work too “Art and Crafty”. Lucie Rie had a better relationship with Wedgwood, but her prototypes were not put into production. 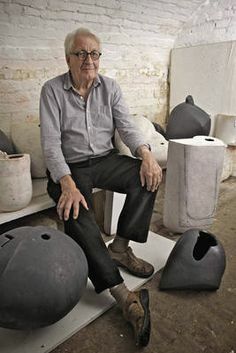 David Queensberry started on the Central course in the early ‘fifties but found that no-one there knew anything about designing for industry and transferred to Robert Baker’s course at the RCA. Gordon Baldwin told me about his experience as one of Billington’s students. “We all had a sort of down on what had gone on in Stoke-on-Trent,” he said. “We were breaking free of Leach, we were breaking free of Stoke-on-Trent, doing all manner of things.” But he enjoyed his term at Burslem art school, visiting potteries, finding out about industrial techniques, sitting in in with paintresses, learning rosebud painting and how to put on transfers, all of which he used in a different way.